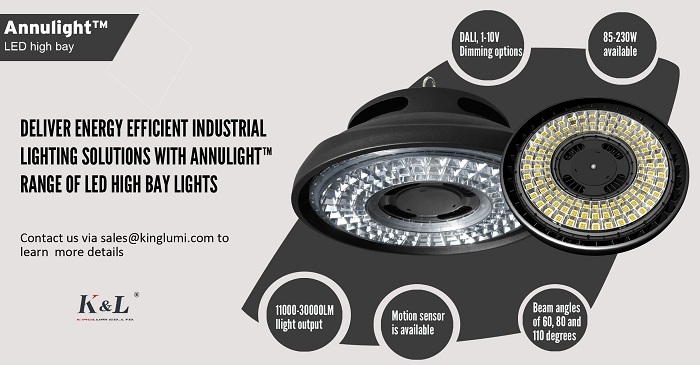 Kinglumi delivers energy efficient industrial lighting solutions with Annulight™ wide range of industrial LED light fixtures featuring smart lighting control and management. 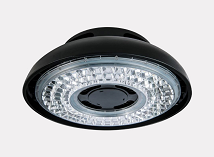 There is built-in 360-degree motion sensor included in such ODM LED industrial lights to turn on/off lights automatically and adjusting the lighting brightness levels based on the changes of surrounding moving objects. 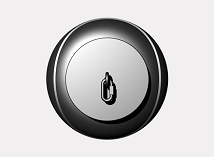 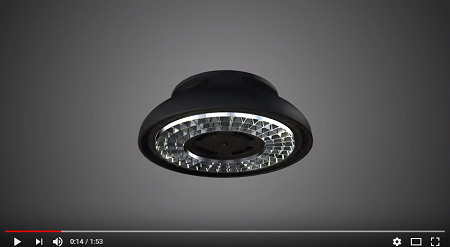 Such Smart lighting control system is able to reduce power use and electricity costs to a large extent, together with helping making contributions to cutting down carbon emissions and building green environments. The energy efficacy of Annulight™ high bay with motion sensor reach up to 130 lumen per watt, helpful to deliver adequate light levels over large and spacious space while keeping power consumptions to minimum level. 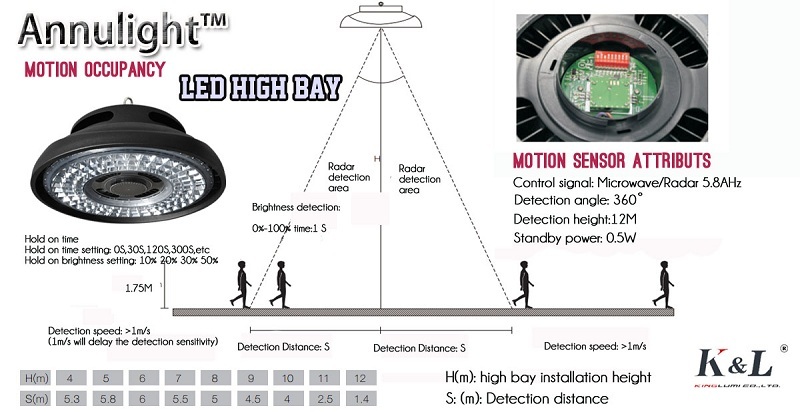 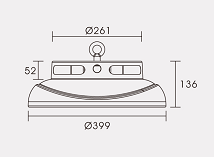 Besides, they are designed both non-dim and versatile dimming solutions ranging from DALI, 1-10V to motion sensor option, essential for adapting the needs of lighting design for wide huge selection of applications. 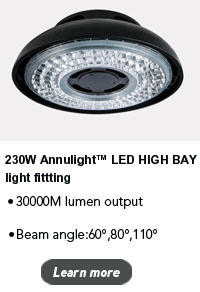 If you want to install light fixtures freely depending on specific installation environments, these industrial high bay light fittings from China are the perfect choice as they can be well placed in surface, suspension, hook mounted as well as wall mounting ways. • Adapting to the requirements of various lighting distributions with multiple wide beam angles including 60°, 80°to 110°. 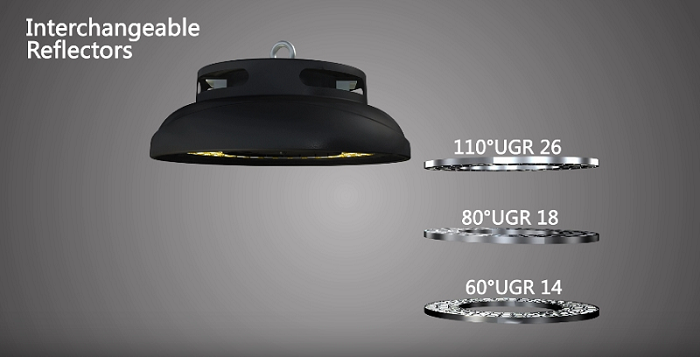 • Equipped with excellent and patented anti-glare reflectors and original Samsung LEDs to achieve perfect lighting effects. 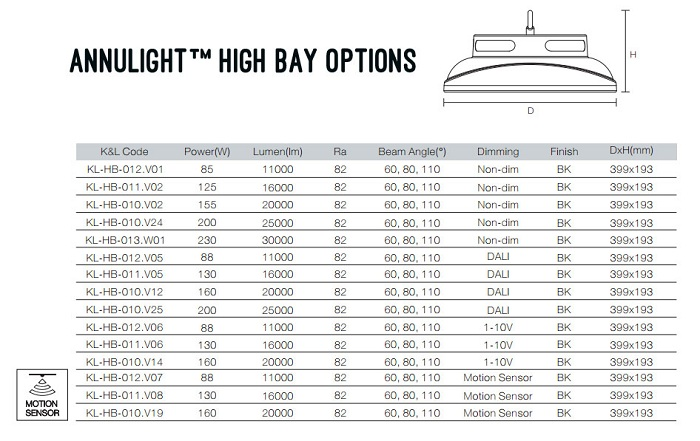 • Color temperatures of 2700K,3000k,3500k,4000k,5000k are presented to meet the needs of different lighting atmospheres. 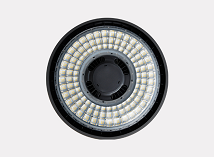 • High quality Meanwell LED driver(100-277V,PF>0.95, MTBF>192Jkrs) is used to ensure long lifespan and high stability.